A key component of workplace safety comes from employees being able to watch out for one another. However, working alone presents a fundamental challenge to watchfulness. How can someone watch a colleague’s back if that colleague is out of sight? Working alone can increase the likelihood of some workplace hazards or risks and, when incidents do occur, the consequences can be more severe. Here are some quick tips to help make sure that you stay safe while working alone. Start by identifying all potential risks on the job site. Think through the entire situation, and identify what possible hazards are present, or can arise, for each step of the task. Be sure you consider the location, nature of the work, what forms of emergency communication are available, and length of time you will be working alone. Also, it is extremely important to be aware of all possible high risk activities, such as working from heights, with electricity, or hazardous equipment/materials, as these present a greater risk to a lone worker. After identifying all potential hazards, it is best to assess the situation. Determine whether you are fully equipped with the knowledge, training, and tools to safely complete the task. If you are fully equipped to handle the situation, then you may safely remove the hazards and use the proper tools to complete the task. However, if you find that you are underprepared for dealing with the hazards, immediately contact a supervisor or safety specialist to report what you have found. Most importantly, be cautious. If something does not feel safe, then do not proceed. Communication is key when working alone. Whether by radio or phone, it is always a good idea to check to make sure that someone knows where you are. Be sure to report any potential hazards to a supervisor or safety specialist as you encounter them. This will help ensure that at least one other worker knows that you were at a potential risk, and he or she can then communicate the potential hazard to any other worker who may be impacted. It is best to stay aware of what others on the job site are doing, and by regularly checking in, you are helping to promote a safe work environment for all. Remember that everyone’s job begins with making sure safety comes first. Charlie attended a KEMI safety training class and made quite an impression on Zach. Charlie’s story is one of hard work, helping hands and second chances. Learn more about Old World Timber at oldworldtimber.com and the Lexington Rescue Mission at lexingtonrescue.org. KEMI is encouraging employers to participate in the OSHA National Safety Stand-Down, a voluntary event where employers will talk directly to employees about safety. 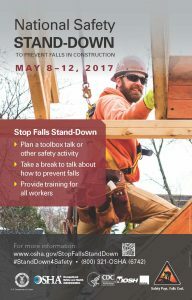 Managers are encouraged to plan a stand-down that works best for their workplace anytime during May 8-12, 2017. One of the most common dilemmas companies face when dealing with employee safety is training. Time is valuable, and many companies struggle to find the time to assemble employees and decide what topics to present. As a loss control consultant, some of the most frequently asked questions I receive relate to safety training. In order to protect our human and financial resources, we need to provide a certain amount of training to ensure that workplace hazards, safety guidelines and our overall safety vision is being communicated effectively. And let’s not forget about satisfying our regulatory obligations. State and federal agencies such as OSHA and MSHA have training requirements that must be met in order to maintain compliance and avoid costly violations in the event of an inspection. So how do we implement a practical training program that educates employees and maintains compliance without draining the bottom line? First, determine which safety topics to cover with employees throughout the year. Base these topics on the kind of work employees perform and the workplace hazards they face, such as working from heights, safe equipment operation, and avoiding exposure to hazardous materials. Emergency preparation measures such as CPR/first aid, fire extinguishers, and preparation drills should also be taken into consideration. Another tool to help identify which safety topics to focus on is an injury data report from your loss runs (KEMI makes these available to our registered users on KEMI.com) or your organization’s OSHA 300 logs. These reports may provide a clearer picture of what areas need improvement and where training time can be most effectively spent. An effective training program will consist of both the required compliance-based topics and the awareness level topics, which are not required by law but are no less important. Awareness level topics include items such as heat stress, tool safety, back safety, electrical awareness, and fall prevention, while compliance-based standards include hazard communication, bloodborne pathogens, personal protective equipment (PPE), and fall protection. Regulatory compliance standards vary based on the industry, and certain OSHA standards, such as Lock Out/Tag Out (LOTO) call for different levels of training dependent upon the responsibility of the employees involved. It is always a good idea to get the opinion of a safety professional, such as a loss control consultant or a member of OSHA’s education and training division, when determining regulatory training needs. 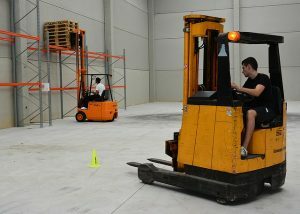 Once the training need has been identified, the next objective is to determine when and how often to provide training. It is important to note that many of these topics can be covered in a short period of time with minimal preparation. Many companies are successful with short 10-15 minute meetings on a weekly or monthly basis accompanied by a monthly or quarterly training session to cover the more complex topics. 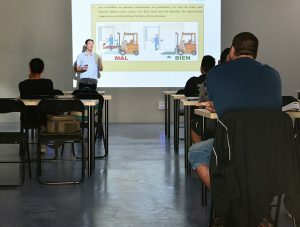 Companies that struggle to assemble all their employees in one location may elect to conduct the more complex training seminars one or two days a year, but the best practice is to continue providing frequent awareness messages through emails, newsletters, and safety flyers throughout the year. Regardless of the delivery method, frequent awareness messages foster a culture of safety by keeping the topic on the minds of employees. Another important consideration when developing your training schedule should be how to handle educating new hires on your company’s safety expectations. Here at KEMI, safety training is a part of the initial orientation process whenever we hire new employees, and we have an annual review of our overall safety program while also providing regular safety reminders to employees on our internal website. One of the most common recommendations I have for companies is to develop a new hire checklist that documents specific items new employees should be trained on when they are hired. Last but not least, it is crucially important to document all your organization’s safety training activities regardless of how complex or simple they may be. This documentation should include the topic, trainer, date, and signatures of those in attendance (click here to access our free safety training sign-in sheet). Good record keeping is not only beneficial in the event of an OSHA inspection, but it may also be shared with your insurance provider to demonstrate your organization’s commitment to keeping your employees safe. KEMI is committed to promoting safer workplaces throughout Kentucky. We offer an extensive collection of free safety resources at www.worksafeky.com and we also provide free onsite training opportunities to our policyholder covering a wide range of topics. Assistance is also available through KYOSHA’s education and training division here. If you have any safety questions or concerns, the KEMI Loss Education & Safety team is happy to help. Simply email us at safety@kemi.com or give us a call at 859-425-7800. 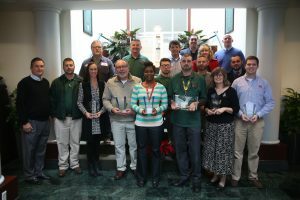 Kentucky Employers’ Mutual Insurance (KEMI) is honoring fourteen Kentucky organizations as KEMI Destiny Award winners for their commitment and success in maintaining a safe workplace. The Destiny Awards are presented annually by KEMI to policyholders that best exemplify KEMI’s motto, “Control your own destiny.” The awards symbolize what can be accomplished when organizations work together to improve workplace safety. “KEMI is honored to present the 2016 Destiny Award to the management and employees of these organizations,” said Jon Stewart, President & CEO of KEMI. “Safer workplaces not only lead to lower workers’ compensation costs, but more importantly it means that employees are going home to their loved ones safely at the end of each shift.”Measures which have helped reduce workers’ compensation costs for this elite group of policyholders include the implementation of formal safety programs, the completion of on-site training and regular safety meetings, and an ongoing commitment to safety from all levels throughout their organizations.